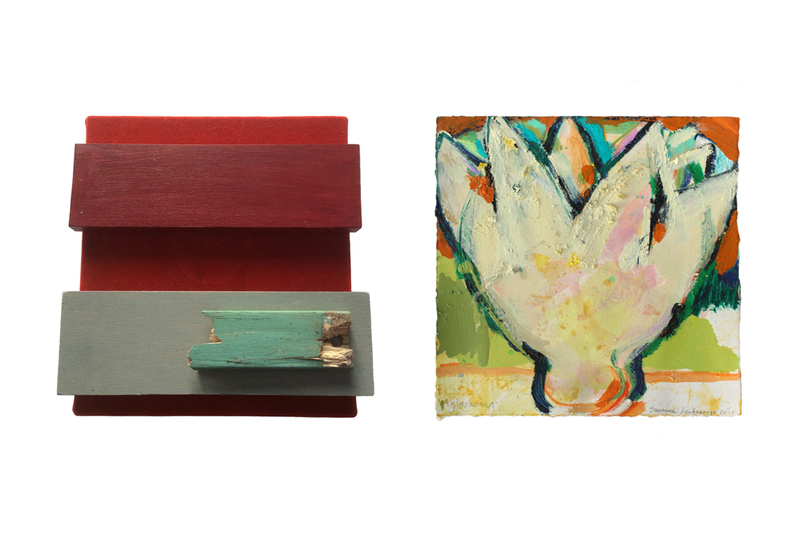 A collaborative exhibition featuring 3D ‘assemblages’ by Katherine Boucher Beug and paintings by Susanne Leutenegger. For two weeks prior to the public component of their project the artists have been engaged in a ‘visual conversation’ with each other’s work and the space. Originally from Princeton, New Jersey, Katherine Boucher Beug has been living and working in County Cork, Ireland since 1971. She received a BA in English and Fine Art from Northwestern University and her dedication to both writing and visual arts has been a significant influence on her work. She went on to study at the Hochschule fur Bildende Kunst in Hamburg with Professor Kurt Kranz who taught Joseph Albers’ colour theory and its practical uses in water-colour and oils. This too was a formative experience with reference to landscape, portraiture, still life and abstraction. During her time in Germany she followed a rigorous, disciplined course in drawing from ‘life’. These two components, colour theory and her daily drawing, formed the solid base from which she went on to explore work in many different media and with many different themes. In 1971 KBB moved to Cork, Ireland where, in a sense, she continued her studies, by teaching drawing, colour theory and lithography at the Crawford College of Art. In 1973 she and her husband bought an old house in Dunderrow surrounded by agricultural land and a forest. The endless weave of roads and hedgerow, the ever-changing skies, shifting light and shadows combined to form her aesthetic. It is here that they brought up their family and here that she has her spacious studio. Her first solo show was in 1973 and she has been exhibiting in Ireland and abroad since then. She has had regular solo shows since the seventies, interspersed with group shows, projects and residencies. One particularly interesting project was her animated film, Begin, developed from her drawings for the Poetry Project (2013). And, in 2017, she initiated Take Five, a major exhibition of contemporary art with four other artists, Vivienne Roche, Stefan Syrowatka, Sarah O’flynn and Charles Tyrell, at The Mill in Kinsale, County Cork. Born in St. Gallen, Switzerland, Susanne Leutenegger graduated in Fine Art from the Crawford College of Art in Cork in 1987 and then established herself as an artist and co-founder of an artists’ collective in Oldenburg, North Germany. She has lived in Switzerland, Great Britain, Italy, Germany and returned to Cork in 1994 where she holds a studio and is a member of the Board of the Backwater Artists Group, Wandesford Quay, Cork City. She is a founder member of Arthaven Gallery in Crosshaven. Susanne also teaches art, including a course on ‘How to draw on the right side of the brain’. In recent years Susanne has established herself as a Feldenkrais teacher feldenkraiscork.com and awareness of movement flows into her artistic practice. Over the years her art work has received international recognition and has been exhibited and is in art collections in Ireland, Germany, Switzerland, Italy. Her most recent solo exhibition was in Berlin (2017).